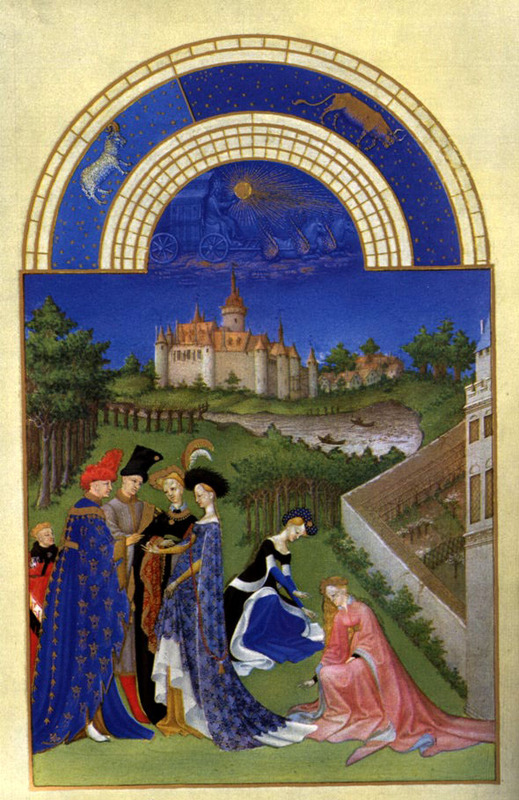 "Tres Riches Heures du Duc de Berry"
The Limbourg brothers, or in Dutch Gebroeders van Limburg (Herman, Paul, and Johan; 1385..1416), were famous Dutch medieval miniaturist painters from the city of Nijmegen. They were active in the early 15th century in France. They are best known for the illuminated manuscript Tres Riches Heures du Duc de Berry. Their grandfather called Johannes de Lymborgh probably came from Limbourg on the Meuse to Nijmegen, then the capital of the duchy of Gelre. His son Arnold was a wood carver who worked for the ducal court. Around 1385 he married Mechteld Maelwael, daughter of a well-todo family of heraldic painters. Herman (Hermant in French sources) was the eldest child (born about 1385), followed by Paul (Polleke; or Polequin in French sources: 1386 or 1387), and Johan (Johanneke; or Jacquemin, Gillequin, or Jehanequin in French sources: probably 1388). They had younger brothers Rutger and Arnold, and a sister Greta. About 1398, after their father's death, their mother sent them to her brother Johan Maelwael (Jehan Maleuel in French sources), a heraldic painter who worked for the French and Burgundian courts. Herman and Johan learned the craft of goldsmith in Paris. At the end of 1399 they returned to visit Nijmegen, but because of a war were captured in Brussel. Their mother could not pay the ransom of 55 gold escuz. The local gold smith guild started to collect the money, but eventually Philip the Bold paid the ransom for the sake of their uncle, his painter; the two boys were released in May 1400. From preserved documents it is known that in February 1402 Paul and Johan were contracted by Philip to work for four years exclusively on illuminating a bible. This may or may not have been the Bible Moralisee, Ms.fr.166 in the Bibliotheque nationale de France in Paris, which is indisputably an early work by the Limbourg brothers. Philip died in 1404, before the brothers had completed their work. Herman, Paul, and Johan later in 1404 came to work for Jean de Berry, a brother of the deceased Philip. He was an extravagant collectioner of arts and especially books. Their first assignment was to illuminate a Book of Hours, now known as the Belles Heures du Duc de Berry; it is preserved in The Cloisters of the Metropolitan Museum in New York. This work was finished in 1409 much to the satisfaction of the duke, and he assigned them to an even more ambitious project for a Book of Hours. This became the Tres Riches Heures du Duc de Berry, which is widely regarded as the ultimate of medieval book illumination, and possibly the most valuable book in the world. It is kept as Ms.65 in the Musee Conde in Chantilly, France. Especially Paul was on good terms with the duke, and became a valet de chambre (personal servant). The duke gave him jewelry and a big house in Bourges. Paul took fancy of a young girl, Gillette la Merciere, but her parents disapproved. The duke had the girl confined, and released her only on command of the king. In 1411 Paul and Gillette married anyway, but the marriage remained childless (the girl was 12, her husband 24 at the time). In the first half of 1416, Jean de Berry and the three brothers Limbourg (all three less than 30 years old) died of unkown causes, and the Tres Riches Heures remained unfinished. 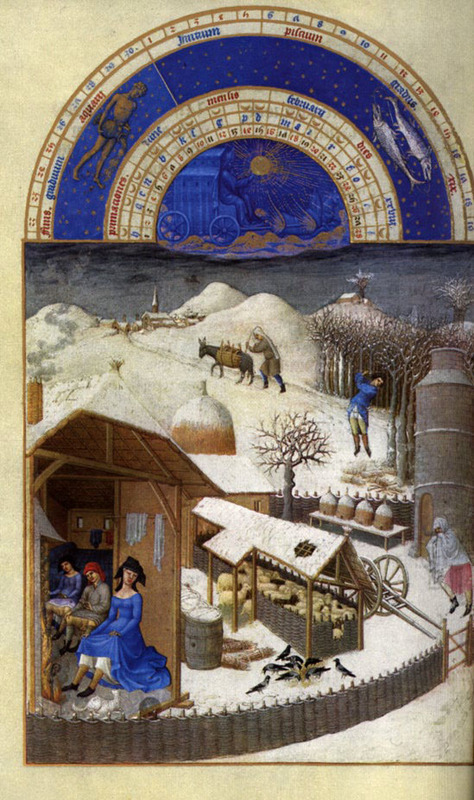 An unidentified artist (possibly Barthelemy van Eyck) worked on the famous calendar miniatures in the 1440's when the book apparently was in the possession of Rene d'Anjou, and in 1485 Jean Colombe finished the work for the House of Savoy. The Tres Riches Heures du Duc de Berry (or simply the Tres Riches Heures) is a very richly decorated Book of Hours (containing prayers to be said by the lay faithful at each of the canonical hours of the day) commissioned by Jean, Duc de Berry in about 1410. It is probably the most important illuminated manuscript of the 15th century, "le roi des manuscrits enluminés" ("the king of illuminated manuscripts"). 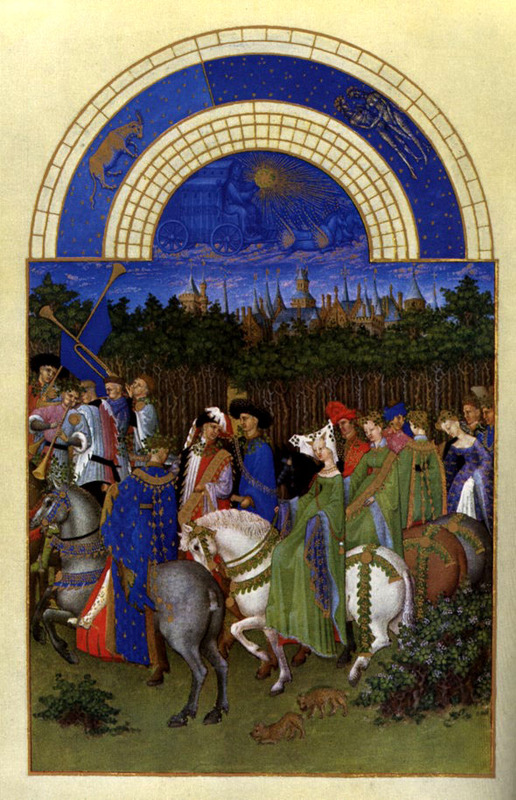 The Tres Riches Heures consists of 416 pages, of which about half are full page illustrations that are among the high points of International Gothic painting in spite of their small size. There are 300 enriched capital letters. 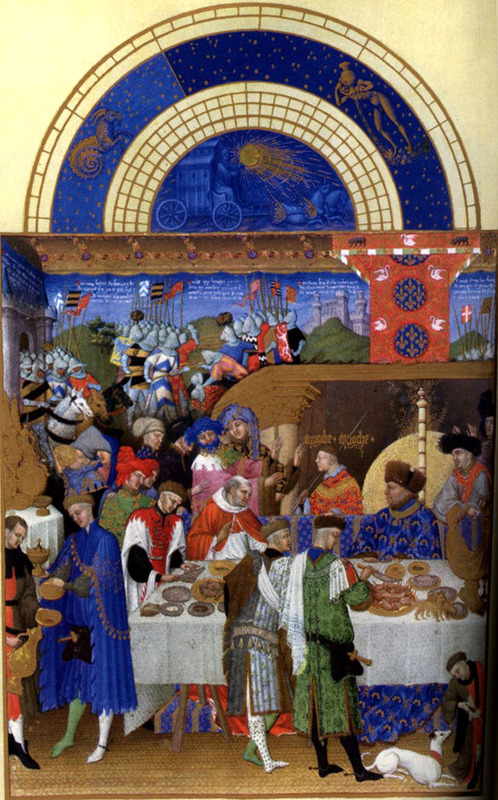 It was natural for a book of hours to contain a calendar, but the illustrations of months in the Tres Riches Heures (see the accompanying illustration showing one of the pages for "January") are exceptional and innovative in their scope, subjects, composition, and artistic and technical execution. They usually show one of the castles of the duke in the background, and are filled with details of the delights and labors of the year, from the Duke's court to his peasants, a counterpart to the prayers of the hours. Each illustration is surmounted with its appropriate hemisphere showing a solar chariot, the signs and degrees of the zodiac, and numbering the days of the month and the martyrological letters for the ecclesiastic lunar calendar. 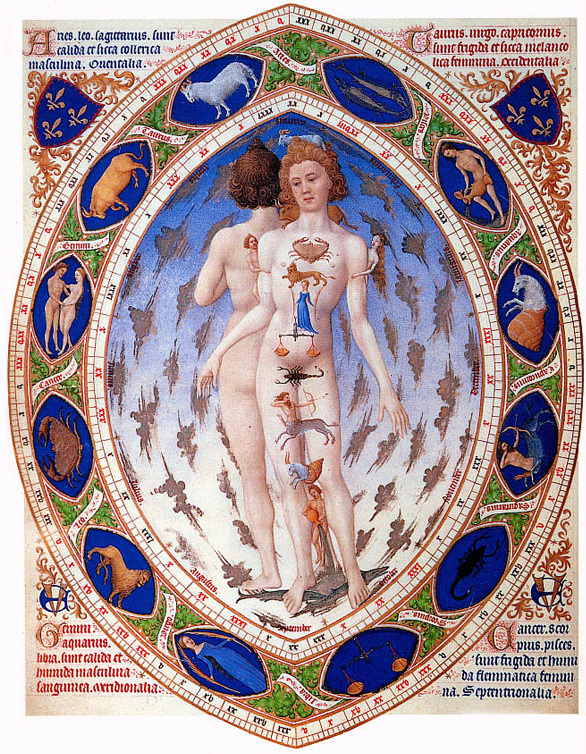 It was illuminated (painted) sometime between 1412 and 1416 by the Limbourg brothers for their patron. The writing, illuminated capitals, border decorations, and gilding was most likely executed by other specialists who remain mostly unknown. 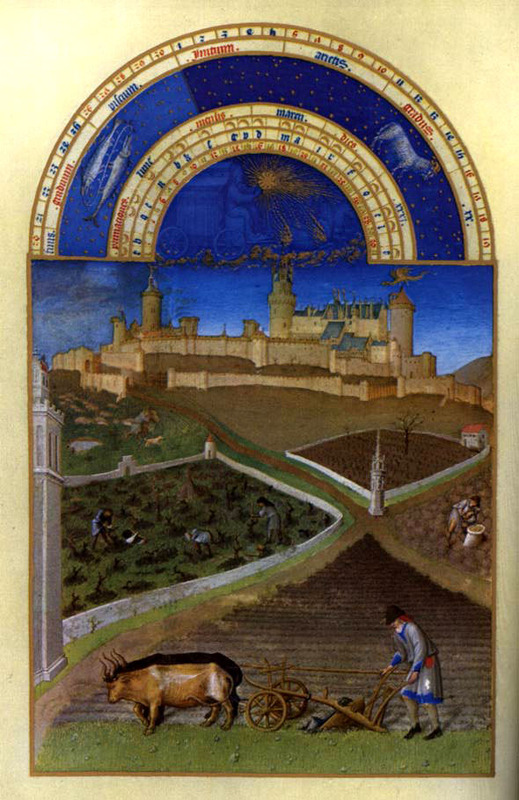 The Limbourg brothers left the book unfinished at their (and the Duc's) death in 1416. The royal art lover (and amateur painter) Rene d'Anjou had an unidentified artist (probably Barthelemy van Eyck) work on the book in the 1440's, and Charles I, Duc de Savoie commissioned Jean Colombe to finish the paintings between 1485 and 1489. The book is currently held by the Musee Conde, Chantilly.